When John Carpenter arrived on the scene in 1976 with his first non-student film, Assault on Precinct 13, it was the beginning of a twelve year cinematic run that’s among the best of all time. During that stretch, he managed to produce a string of films that have gone on to become cult classics. Some of them (Halloween and The Thing) rank among the best horror films ever, and the likes of The Fog, Christine, and Prince of Darkness aren’t too shabby either. Most fans would tell you that Carpenter mysteriously lost something once the calendar turned over to 1990. While it’s hard to argue that his 90s output wasn’t nearly as impressive, he did manage to churn out In the Mouth of Madness and Vampires, two films that are generally given their due these days. The one film that is most forgotten during this era is his 1995 redux of Village of the Damned. A reworking of the 1960 film of the same name and the original The Midwich Cuckoos novel, Carpenter’s film likewise finds us in the small, isolated town of Midwich, California. It’s an idyllic little village, quaintly tucked somewhere near the coast and far away from the worries of big city life. One day, a mysterious force permeates through the town, leaving everyone unconscious for hours at a time. Everyone awakens at the same time, groggy and confused, and it turns out ten women have become pregnant at the same time. Nine months later, all the women give birth on the same night, with the exception of one, who delivers a stillborn. The other babies are perfectly healthy; in fact, they’re a little too perfect and a little too creepy. They grow up at a rapid rate and quickly advance in intelligence before turning hostile towards the town. It’s up to a widower doctor (Reeve), a widowed teacher (Kozlowski), and a doctor (Alley) to uncover the truth about the demon seeds before they destroy the town…and possibly the world. I consider myself a pretty big Carpenter fan, but even I have to admit that Village of the Damned is one I’ve not revisited too many times. Back in the mid-90s, one of the local video stores always put posters up for the new releases each week, and I can remember being drawn in by the creepy kids and the fact that it starred Reeve (who I’d seen countless times in Superman). I rented it then and never revisited the film until I bought the DVD about five years later. That DVD then sat on the shelf for about a decade, until recently. Between that time, I managed to track down the two original Damned films and check them out, so I was curious to see how Carpenter’s version would look. Fifteen years since its release, it’s still pretty clear that this isn’t one of Carpenter’s best; however, it’s not an altogether poor film by any means, and it’s actually quite effective and creepy at times. As a remake (or, really, a re-adaptation), it’s solid because it remains faithful to the plot of the original but adds its own twists and ideas. A paranoid, post-1984 Big Brother vibe that shows a wariness towards big government, conspiracies, and cover-ups is substituted for the Cold War sensibilities of the original films. There’s an early scene where the government descends on the town in an almost militant fashion, and we see Alley’s character talking to some mysterious government officials in a dark room. It’s kind of creepy, and we’re not even sure if we can trust Alley herself; the sort of cynical, paranoid tone of these proceedings feels ripped right out of Romero’s The Crazies. Carpenter touched on similar subjects and themes in They Live, but there admittedly isn’t much done with it here once the film shifts its focus away from the government element. This film also separates itself from the original with its stark portrayal of graphic violence. 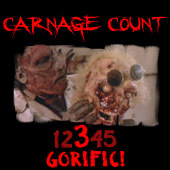 It’s by no means a gorefest, but the violence is quite brutal at times and is rarely stylized. The children force the adults in the town to off themselves in several demented ways--they jump off cliffs, shoot themselves, impale themselves, and a few corpses even turn up charred and extra crispy. The kids themselves are kind of spooky in their appearance--the uniform, bleached hair look combined with the glowing eyes give them an other-worldly quality (which, of course, is appropriate). The “creepy kids movie” is pretty much a sub-genre in and of itself at this point, and I suppose the ones here fit in well enough with their counterparts. They’re unnerving in their maturity and their stilted, emotionless mannerisms, and Carpenter often highlights the synchronicity and uniformity of their movements to great effect. The cast is an eclectic gathering, and there’s not many familiar Carpenter faces. Christopher Reeve (in his last role before his tragic accident) is a solid lead that brings a lot of screen presence to the role of the town doctor. He definitely channels a bit of his Superman performance here, as he brings a virtuous, likeable quality to the role. There really aren’t a terrible amount of character moments in the film, but the sub-plot involving him and one of the children (Thomas Dekker, of Sarah Connor Chronicles fame) is well done because of Reeve’s vulnerability there. The rest of the characters really feel like they’re here to amp up the body count, but they’re acted well enough. It’s fun seeing Mark Hamill as the town priest, though it is a little creepy when he wields a gun and targets one of the kids. There’s also the late, great George “Buck” Flower (who actually was in Carpenter’s Escape From New York), and if you pegged him as the town vagrant, guess again. He’s actually the school janitor who winds up on the kids’ bad side when he slaps one of them around. Still, there’s something just a bit amiss with the film, and it mostly begins with the script, which is a bit too rushed for its own good, despite the fact that three writers worked on it. Characters drop in and out to the point where the story seems a bit disjointed. This is especially true of Alley and Kozlowski’s characters, who really aren’t given much to do. Alley’s character is especially a bit of a mystery, as we never find out exactly why she’s privy to so much government information. Any other sort of sub-plots, like the aforementioned government element and the relationship between Reeve and Dekker’s character aren’t explored with much depth and have little baring on the overall picture. It’s a film that mostly exists as a fright-fest, and it seems like that’s what Carpenter was most interested in. He actually shows some sign of his vintage talents--his use of the Panavision frame is still masterful, his score is typically synth laden and low-key, and there are some nice, creepy montages where he uses the desolate, isolated landscapes to set an eerie mood. Of course, somewhat flawed Carpenter film is still a worthwhile experience. Village of the Damned is a good film that borders on being great. Had there been a more polished script and more conviction to explore the film’s themes (instead of merely paying them lip service), we’d probably be looking at a film that could have at least stood toe to toe with Carpenter’s minor horror hits. Instead, it’s a decent little shocker that’s worth a look, especially if you’re a fan of Carpenter. The DVD that Universal released 12 years ago is still decent as far as the presentation goes. The anamorphic transfer is solid, but not stunning, while the 5.1 Dolby Digital track fills up all the speakers and is very bass heavy and boomy (no doubt to impress early surround sound adopters). The only special feature is a theatrical trailer, which means there’s no Carpenter commentary, which always has the potential to be fun (look for his cameo at a pay phone early on in the movie itself though). It’d be too easy to joke that Carpenter’s cameo was indicative of him phoning the film itself in, plus I don’t think it’d exactly be true. Rent it!